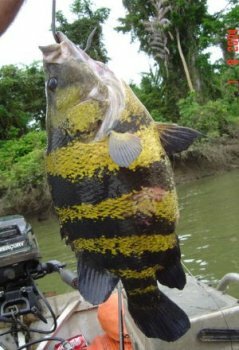 This specimen was caught in the Fly River, Papua New Guinea by Graham Weston, who contributed this photo. It measured about 40cm/16" in length. Synonyms: Coius campbelli (not valid, see discussion). Size: 18" (45cm) or larger. Origin: Indonesia (Irian Jaya) and Papua New Guinea: brackish river mouths, coastal lagoons and rivers above tidal influence including the Fly, Lorentz and Oriomo rivers. Tank setup: A large tank (100 gallons/450 litres plus for an adult) with open swimming space, subdued lighting. Compatibility: Predatory, will eat smaller fish. Keep with other large non-aggressive fish. Reported to be very aggressive towards others of its own species, but seems to mix with other Datnioides tigerfish ok.
Water chemistry: Maintain in brackish conditions or medium hard and alkaline freshwater. Feeding: A predator, but but they can be weaned onto dead meaty foods such as whitebait, cockles, mussels and prawn/shrimp. Bloodworm and krill is suitable for juveniles, and adults may take earthworms. Comments: This Couis/Datnioides species is rarely available in the aquatic trade, and is likely to be expensive when encountered. They are easily distinguished from other Datnioides by the gold base colouration and the indistinct edges to the black bars and irregular black spots. The head region can appear greenish. The body colour can appear very dark at times, particularly in stressed specimens, with the head almost black.